I always love seeing everyone’s healthy meal plans for the week, and realized I haven’t posted mine for awhile. I currently have several friends on the Advocare 24 Day Challenge and some starting up soon, so I know these were always helpful for me when I felt like all I was eating was chicken and veggies all week. There are so many awesome clean recipes out there that you should never feel bored by your options. Here’s our line up for the week! Tuesday- Greg had a work event so I just had a “breakfast for dinner” night. Eggs, sliced tomatoes from the garden, and a piece of toast. My favorite clean bread is from Trader joes….It’s called California Style Sprouted Wheat. Thursday- 4th of July! We will be BBQing so I’m sure we will stick to some salads, bunless burgers, corn, watermelon and beer!! One of those items isn’t clean, can you guess which? Saturday- Having friends over for a BBQ….going to do different kinds of kabobs and make a tomato, cucumber, basil salad. Sunday- Shredded zucchini turkey burgers and sweet potato wedges. Last weekend I made a really yummy salad from items we got at the farmer’s market that I wanted to share with you. I usually just mix kale in our smoothies but I wanted to try to have it on it’s own in a salad and really enjoyed it! Whisk dressing together and toss into salad. That’s all. So so so yummy!! Enjoy! I hope you all have a happy and safe 4th of July!!! I am going to try this salad next week! Yum! The salad was delicious! Actually – everything we eat is delicious and has helped me lose 40lbs! A special shout-out to the Advocare 24 Day Challenge!! Adorable comment by your main squeeze. So cute. That salad looks so good – did you chop up the kale really small or just leave it in big leaves? 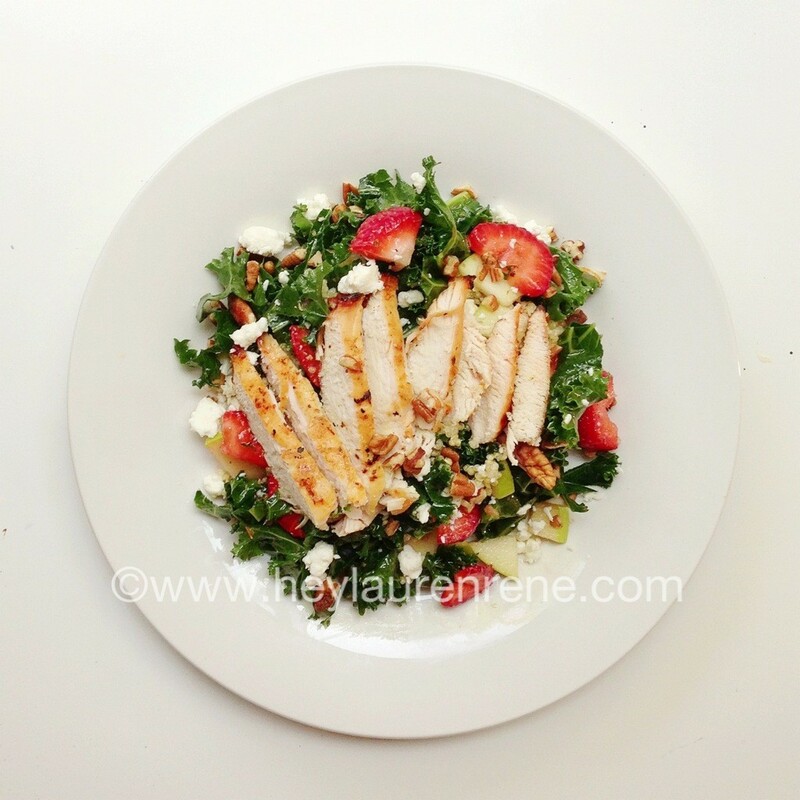 I’ve never eaten kale raw so I’m a little hesitant but the salad looks SO good that I’m willing to try. Hi Kara!! Hope you had a great weekend! I just chop the kale up really small. I heard if the kale is a little tough you can “massage” it a bit between your hands and then chop it up. I hope that helps. Definitely give it a try! !